Existing U.S. nuclear power generating plants operate under increasingly competitive market conditions brought on by relatively low natural gas prices, increasing electricity generation from renewable energy sources, and limited growth in electric power demand. 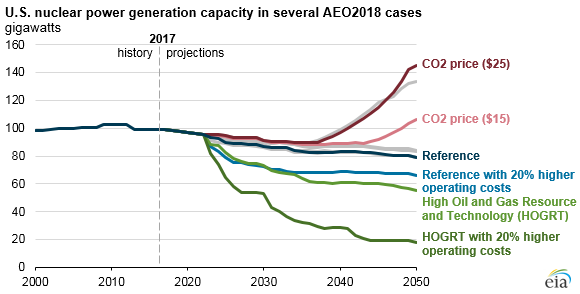 Several sensitivity cases prepared for EIA’s Annual Energy Outlook 2018 (AEO2018) show the potential effects on the U.S. nuclear power fleet of different assumptions for natural gas prices, potential carbon policies, and nuclear power plant operating costs. Currently, 60 nuclear power plants operate in the United States with a combined electricity generating capacity of 99 gigawatts (GW). Nine plants with a combined 11 GW of capacity have announced plans to retire by 2025. Based on assumptions in the AEO2018 Reference case, which reflects current laws and regulations, EIA expects additional unplanned retirements will reduce total U.S. nuclear generating capacity from 99 GW in 2017 to 79 GW by 2050. Higher or lower natural gas prices. About half of the existing nuclear fleet operates in deregulated wholesale electricity (i.e., merchant) markets, where natural gas-fired generators can and sometimes do set the marginal price for electricity. For this reason, changes in natural gas prices affect electric power markets. Two sensitivity cases with different assumptions for oil and natural gas resources and technology result in higher and lower natural gas prices. 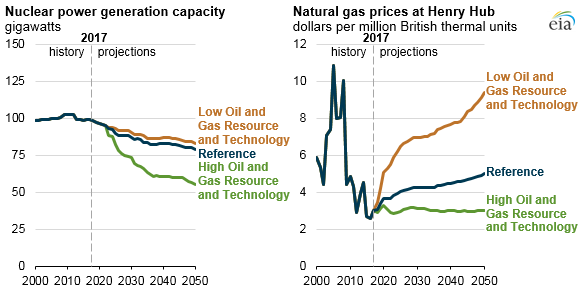 In the High Oil and Gas Resource and Technology case, lower natural gas prices lead to more nuclear retirements, and total nuclear capacity falls to 55 GW by 2050 in this case. 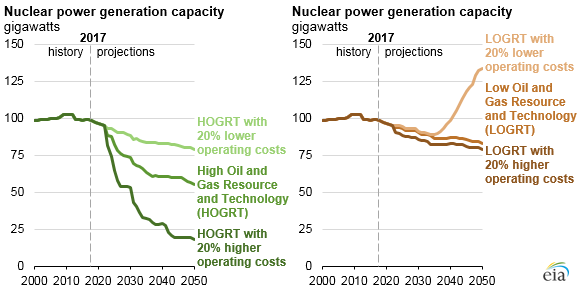 Conversely, in the Low Oil and Gas Resource and Technology case, higher natural gas prices lead to fewer nuclear retirements, but nuclear capacity still falls to 83 GW in 2050. In all three of these cases, no additional nuclear plants come online beyond the units currently under construction in Georgia (Vogtle Units 3 and 4), but in some locations nuclear power plant capacity increases because of uprates. Higher or lower nuclear operating costs. Operating costs have played a major role in recent retirement decisions. At least five currently operating nuclear plants have requested state-level price support to continue operating. In two sensitivity cases, assumed operating costs were raised or lowered by 20%. On their own, changes in operating costs have a relatively minor effect on changes in nuclear capacity. With higher operating costs, nuclear capacity falls to 66 GW by 2050; with lower operating costs, nuclear capacity falls to 84 GW—levels that are 13 GW lower than and 5 GW higher than Reference case capacity in 2050, respectively. Combined effects of higher and lower natural gas prices and operating costs. Four cases combine the assumptions above so that higher and lower natural gas prices are combined with higher and lower nuclear operating costs. Nuclear capacity increases the most in the case that combines high natural gas prices and lower nuclear operating costs, resulting in 134 GW of nuclear capacity by 2050, or 35 GW higher than current levels. Conversely, the combination of low natural gas prices and higher nuclear operating costs reduces the nuclear fleet to 18 GW, or about 18% of the current nuclear power fleet. Effects of various carbon fees. Potential policies that would subject fossil fuel-fired power plants, such as those fueled by coal, natural gas, and petroleum, to fees based on their carbon dioxide (CO2) emissions would result in higher wholesale electricity prices, and in turn, would allow nuclear power plants—which do not generate CO2 emissions—to become more economically competitive. Two cases implement fees of $15 per ton of CO2 and $25 per ton of CO2 (in 2017 dollars) starting in 2020, increasing by 5% in each subsequent year in real dollar terms. In both cases, much of the existing nuclear fleet remains competitive, and additional nuclear plants are constructed so that capacity in 2050 is higher than current levels. With a $15 per ton CO2 fee, nuclear capacity increases to 106 GW in 2050; at $25 per ton, capacity increases to 145 GW in 2050. The full analysis on the AEO2018 Nuclear Power Outlook provides additional detail on the current electricity market environment, recent and announced plant retirements, certain state policies supporting nuclear power, and implications for the electricity generating mix across the sensitivity cases discussed above.